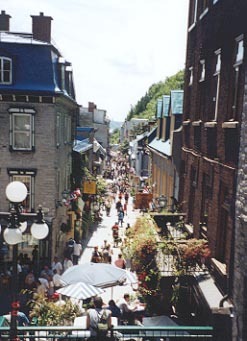 Quebec City has a reputation for quality restaurants whether your preference is a refined menu, a typical Quebec home-style dinner or an ethnic specialty. We opted for the refined menu at Laurie Raphael Restaurant, 117 Dalhousie, Vieux-Port. 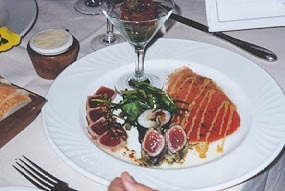 The restaurant is owned by renowned chef Daniel Vezina and his wife, Susanne Gagnon, and named after their two children. Daniel was named Chef of the Year in 1997 and specializes in New American Cuisine. The restaurant is located in a building that is an extension of a lovely apartment complex with an outdoor patio that surrounds the glass exterior. There are two beautifully furnished dining rooms. We sat in the less formal room with the intimate environment created by warm red walls, a few pieces of attractively framed art and a dark gray, layered ceiling. Our waiter was pleasant, knowledgeable and extremely helpful. The menu presented a challenge as each offering was a dream - and we were praying our dreams would come true. Let us start with the presentation of each course - so mouthwateringly spectacular that Linda insisted on taking photos of every plate! Ile d'Orleans (an island just off the mainland) fresh asparagus - roasted with clarified butter, tossed with parmesan and accompanied by shaved stalks marinated with white truffle oil and lemon with sautéed pink oyster mushrooms. It was heaven, as was the other appetizer of Lac St.Pierre crayfish parmentier parfumed with tarragon oil, cold bisque emulsified with mussel juice. We could have enjoyed an entire meal of the homemade walnut, olive, herb and sun dried tomato and pesto breads. As was obvious, Daniel uses the best of local ingredients and the best available of everything else. Our main courses reflected this theme. Iles-de-la-Madeleine scallops were seared and presented with an exotic fruit salsa with fresh shrimp from Sept.-Iles, baby bok-choy, red curry and cocoanut milk sauce. Fresh Iles Mingan crab in crispy rice paper with bouillabaisse sauce as on the Poquerolle Islands with a duo of green and white asparagus sautéed in lemon butter was astounding. An assortment of yellow fin tuna from the Gulf of Mexico blew me away, each preparation was magical: tempura with balsamic vinegar and white truffle oil, carpaccio with ginger and soya, tartare with Sevruga caviar, tataki with shallots, sesame and lime and Inspiration of the day maki. We all agreed that this was one of the finest meals we have ever had. Of course the final test had to be desserts - more photos, more ecstasy. Example: death by chocolate - milk chocolate and hazelnut praline ice cream, white chocolate creme brulee, velvety bitter chocolate mini cake, maple fondant and Domori mousse chaud-froid. Example: maple gourmet dish - white chocolate turnover with maple butter, maple creme brulee with pecans, Sortilege mini souffle and maple ice cream. Example: velvety chocolate cake - crushed cocoa bean tuile, fresh fruit salad, Madagascar vanilla ice cream. This was a truly memorable experience - pricey, but we've paid more and gotten a lot less. While we are talking about food is a good time to let you know that the buffet breakfast at the Frontenac is bountiful. The Cafe De La Terrasse is the perfect spot to start the day. It's located on the lower level surrounded by windows giving out onto the adjacent Dufferin Terrace boardwalk. The Cafe is divided into many pleasant rooms offering a feeling of intimacy that belies the size of the facility. No sooner were we seated than our glasses were filled with fresh orange juice and our coffee order taken. After a long, leisurely meal feasting on the varied hot and cold offerings, limiting lunch to coffee and a sweet or an ice cream was in order. By the way, the kiosk on the Dufferin Terrace has a wonderful selection of ice cream flavors and delicious waffle cones too. A 20-minute drive north took us to the Montmorency Waterfalls, a natural wonder just outside the city. The water gushes from a river on high (98 feet higher than Niagara) between shrub-covered mountainsides and drops to a thirty-foot deep bottom before it flows onward to the St. Lawrence River. There is a cable car (which we took) or a stairway to the top, where there is access to steps leading to a bridge right across the waterfall; the sights and sounds from there explode the senses. In the winter, the mountains on either side of the falls become sheets of ice on which ice climbing enthusiasts practice their skills. On the way to the falls, we passed but did not have time to visit, Ile d'Orleans. First settled in 1648, it has become a living showcase of life as it was. Originally settled by 300 families, independent and committed to living life in their own way, visitors can witness the old trades, discover the history, culture and heritage of the inhabitants, pick their own crops and appreciate the hard-working past of the farming and shipbuilding industries of the island. It's easy to see why this area is an outdoor enthusiasts' playground. The mountains, forests, lakes and rivers are a dream for all seasons. The Museum of Civilization, 85 rue Dalhousie, is a stunning, modern structure in the center of the historic lower town. This is no ordinary museum. It's a thematic museum that focuses on participation and interaction and a place of amusement and reflection. The featured exhibit was Syria with more than 400 pieces of outstanding historical interest, some of them shown outside of Syria for the first time, and others recent archeological discoveries. This is the first showing and the exhibit will move to museums in Canada and the U.S. before permanently returning to Syria. Growing-Up is a highly interactive, youth-oriented exhibit, which will close on September 4, 2000. Memories, a permanent exhibit, presents a vision of the history of Quebec. Encounter with the First Nations, another permanent exhibition, shares the vision and lifestyle of the eleven aboriginal nations that inhabit Quebec. Crossings Seen by Robert LePage deals with the affects of cross-cultural relations between human beings, language, nature, sciences and technology. This is the vision of LePage and the creativity of the presentation is mind-boggling. You have until September 3, 2001 to figure it out. There are many more exhibits but we ran out of time. We took the ferry (ten minutes each way) across the river to Levis to get a panoramic view of the city from the water. The sun shone brightly so it was a real treat. There is no shortage of shopping opportunities as you navigate the narrow, cobblestone streets. We found the authentic Quebec offerings such as Inuit carvings, wood sculptures, handicrafts, apparel from Quebec designers, paintings and antiques most interesting. With only a delightful coffee and pastry break at Champenoise Patisserie Boulangerie, 6 rue du Cul-de-sac, Quartier Petit Champlain, during a long day of touring we were getting hungry and in the mood for simple bistro food. Le Cafe du Monde, 57 rue Dalhousie, seemed to be the perfect place. True bistro atmosphere welcomed us warmly with wood, mirrors, black, white and a touch of neon. Our lovely waitress was quick to bring us a jar of tiny dill pickles (cornichons) to whet our appetites. We enjoyed starters of gratinated onion soup, outstanding fish soup and a salad of tomato and marinated bocconcini. We all shared an order of mussels steamed in white wine, onion and bay leaves and luscious fries. For mains two of us had steak and frites, and the others ordered spicy farfalle with scallops and shrimps and liver, bacon and onions with real and delicious mashed potatoes. Everything was super - a perfect ending to a perfect visit to a perfect city.